Getting blackheads on your nose can be quite unattractive. Many times, they're due to your pores being wide open and dirty. To be able to remove them, you'll find a home trick in this article that also helps prevent their occurrence. What would you do to avoid blackheads on your face? 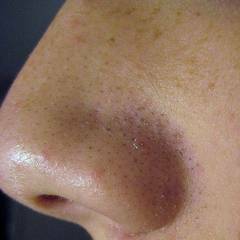 Do you usually get blackheads on your nose? Well, do not despair! You're not the first nor the last to suffer from them. This unsightly skin reaction is the product of open pores becoming clogged with dead skin cells, pollution of the environment and your skin's own oils. The blackhead is associated with dirt, however, their color is the result of oxidation. When in contact with oxygen, the oils that clog your pores oxidize and darken. On the other hand, if your skin is oily you'll be much more exposed to their appearance. Do not use cosmetics that are greasy because they clog your pores. Avoid using soaps in the form of a stick. Exfoliate your skin frequently to remove dead cells and prevent clogging the pores of your skin. Restrict the use of makeup, and when you use it completely remove it all before bedtime. Wash your face often, simply with fresh water. Undoubtedly, blackheads, also known as open comedones, are very unattractive and a big concern for those who suffer them. But it is not a matter for alarm since this homemade trick that I propose for you is perfect for your skin to be clean and without those bothersome blackheads. To begin this treatment for blackheads of the nose, prepare a liter of chamomile tea. Of course, to make it you must place a few tablespoons of the flowers (or tea bags) in a liter of water directly into a pan. When it begins to boil, just position yourself so that the vapors reach your face because that way, you will be able to achieve the opening of your pores and cleanse your skin. After several minutes like that have passed, you have to exfoliate your face using a mixture of sugar with lemon juice. Leave the mixture on your face for 15 minutes. To finish off this homemade trick against blackheads, the ideal thing to do is to rinse your face very cold water. This will help your pores to close up and therefore, avoid that new blackheads get formed again quickly and appear on your face. In this video you can see step by step how to prepare this homemade trick. While this recipe is one of the most effective, it is not the only one you can use to remove those pesky blackheads. You can also try these other alternatives. This trick is very effective and easy to prepare . You just have to mix both ingredients and, heat it about 15 seconds in the microwave to thicken. Then you have to put this mixture on by drawing a strip on the nose (preferably with a brush), wait about 10 minutes (or until solid) and remove it to descale the blackheads. These strips are quite safe, even for sensitive skin, but you should be aware that as soon as you withdraw them a slight redness may appear, but it disappears within minutes. Functions similarly to that of the gelatin bands, with the difference that the emollient and moisturizing properties of almond oil and honey are added. To prepare mix the ingredients, place them in a double boiler until thickened, let cool a few minutes and put the mixture over the area to be treated. After about 25 minutes, remove it. This trick is ideal for those who don’t have very oily skin, due to the almond oil and honey. Prepare a paste with two slices of crushed tomato, the gel of a stem or leaf of aloe vera, and fine or coarse salt. Place it on the areas where you have blackheads, while doing gentle massage in circular motions. Leave it on for 15 minutes, then remove it with cold water. Keep in mind that due to the high astringent and exfoliating power of the ingredients of this mask , it’s not suitable for sensitive skin. How do you remove them from your nose? Write your comment in "Home trick for blackheads"